Nathan Law (L), Joshua Wong (C) and Alex Chow (R), leaders of Hong Kong's 2014 pro-democracy 'Umbrella Movement,' chant slogans as they address the media before their sentencing outside the High Court in Hong Kong, Aug. 17, 2017. 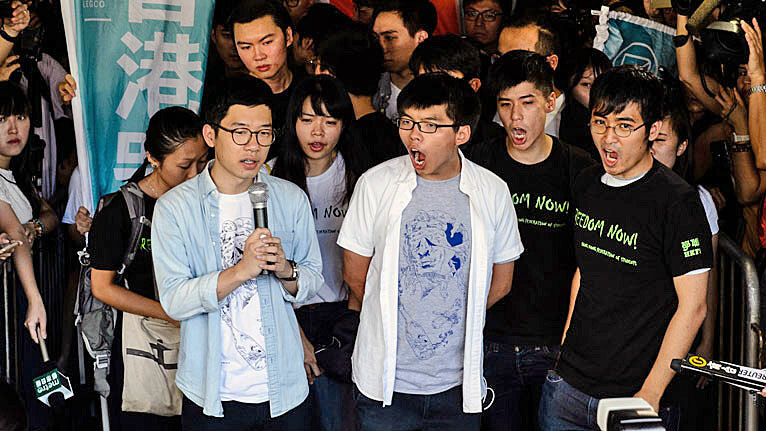 Legal scholars in Hong Kong on Friday slammed the jailing of three student leaders of the 2014 pro-democracy movement, with some saying the court overstepped its bounds and others saying the decision was highly political. Eric Cheung, law professor at the University of Hong Kong, hit out at the decision by the Court of Appeal which handed down jail terms of up to eight months for Joshua Wong, general secretary of the political party Demosisto, ousted Demosisto lawmaker Nathan Law and former student leader Alex Chow after the government asked for a review of their community service and suspended sentences. Cheung said the ruling came after the Eastern Magistrate's Court found last year that no acts of violence had been committed. "That was not the evidence; that was not the finding by the magistrate. If there had been ... I wouldn't have a problem with the Court of Appeal changing the sentence from community service to prison," Cheung said. "But the Court of Appeal seems to have stepped outside its jurisdiction, and departed from the accepted norms," he said. "There should be a reasonable argument to take the case to the Court of Final Appeal, on the basis that the Court of Appeal has departed from accepted norms." The three had previously been sentenced to community service and a suspended prison sentence by a magistrate after being found guilty of charges relating to "illegal assembly" linked to their storming of a cordoned-off area near Hong Kong's legislature. Derek Lam of Demosisto, which was set up after the failure of the 2014 Occupy Central movement to win approval for fully democratic elections from Beijing, visited Wong at the Pik Uk detention facility for offenders under 21 on Friday, and called on supporters outside to show some support. "I have just been in to visit Joshua Wong," Lam said. "The thing he most wanted to say to the people of Hong Kong was that we shouldn't give up [the struggle for democracy]." "Hong Kong people should think carefully about the state of the rule of law and about our justice secretary Rimsky Yuen," he said. Reuters quoted an unnamed government source as saying that top prosecutors had initially "not recommended pursuing" the case against Wong, Law and Chow, but that Yuen had overruled them, insisting that the review must go ahead. "[Wong said] he had seen the Reuters report about Rimsky Yuen," Lam added, before addressing supporters outside the detention center. "I want to drum up some support here at the gates, because it is possible to hear from inside," Lam told gathered well-wishers. "Let's make sure he can hear us." Yuen brushed aside the Reuters report on Friday, telling reporters: "There was no political motive involved here, definitely not. Differences of opinion aren't important." Law professor Benny Tai, one of the original instigators of the Occupy movement, dismissed Yuen's denial. "The courts aren't just in charge of implementing the letter of the law; they are also in charge of implementing its spirit," Tai told reporters. "This means they must respect the dignity of citizens in a fair and impartial manner." "There is no doubt that this was a political decision, so they are going for stiffer sentences ... as a deterrent, instead of investigating why this group of young people came out in protest in the first place," he said. Beijing on Friday rejected international criticism of the jailing of the activists. "Hong Kong people are fully entitled to rights and freedoms, but no one can use the excuse of so-called democracy and freedom to conduct illegal violent activities," foreign ministry spokeswoman Hua Chunying told a regular news conference. "I want to reiterate that Hong Kong is a special administration of China... China is firmly opposed to any external forces interfering in Hong Kong affairs," she said. Meanwhile, the city's last colonial governor Chris Patten said the student leaders would be remembered long after he was. "I think they will be remembered, and their names will be remembered, long after nobody can remember who I was, and perhaps nobody can remember who President Xi Jinping was," Patten, now chancellor of Oxford University, told an audience at the Edinburgh Book Festival, according to its official bulletin. "We should be proud of what those kids are doing," he said.